Unlike the Gloster Meteor - which was always intended to be an interceptor - the de Havilland Vampire began as an experimental aircraft, originally developed to specification E6/41. Design of what the company named the DH-100 began at the de Havilland factory at Hatfield in mid-1942, some two years after the Meteor began development. Known in the company as the “Spidercrab,” the aircraft utilized de Havilland's extensive experience in using molded plywood for aircraft construction, and was the last composite wood/metal construction high performance military aircraft. To reduce thrust loss, the single H.1 engine - later known as the Goblin - in the egg-shaped aluminum-surfaced fuselage (which had a wooden basic structure) had a short exhaust pipe, with the rear control surfaces on twin booms to either side of the fuselage. While the design looks strange today, at least two contemporary German jet fighter projects used a similar layout. The first prototype, LZ548/G, was flown by Geoffrey de Havilland on September 20, 1943, only six months later than the Meteor. The production Mk I - by this time known as the “Vampire” - did not fly until April, 1945. Almost all Vampire F Mk.Is were built by English Electric, due to the commitment of de Havilland for production of the Mosquito series. The first Vampire F Mk.1 was taken on charge by 247 Squadron in March 1946. Improvements were introduced on the line and as production progressed, with the Goblin 2 of 3,100 lb thrust introduced along with auxiliary under wing fuel tanks with the 40th airplane and a pressurized cockpit and bubble canopy from the 51st. The centrifugal engine was thirsty, and the early Vampires suffered from having a range of only 730 miles. The range problem was addressed in the Vampire F Mk.3, built to specification F.3/47, which carried additional fuel in wing tanks that extended the range to 1,145 miles. The tanks caused stability problems, which were solved by lowering the horizontal stabilizer, widening its chord, and changing the shape of the fin and rudder. The prototype, TG275, first flew on November 4, 1945 and the F Mk.3 entered service with 54 Squadron in April 1948. The most-produced combat variant of the Vampire was the FB Mk.5 with 473 aircraft. The FB Mk.5 utilized the type’s good handling qualities for ground attack. The wingtips were clipped and the wings strengthened to carry two 1,000lb bombs or eight rockets. To compensate for the higher wing loading, a longer-stroke undercarriage was fitted. The prototype, TG444 - a converted F Mk.1 - flew on June 28, 1948 and the first production aircraft followed in June 1949, with first deliveries to 54 Squadron that fall. The FB Mk.9 was optimized for tropical operations with an air conditioned cockpit, and was otherwise distinguishable from the FB Mk.5 by an eight inch increase in the starboard wing root fillet to house the air conditioning unit. The FB Mk.5 became the first jet aircraft operated by the Royal Navy as the F Mk.20, with the wing strengthened and the dive brakes and flaps enlarged to reduce landing speeds. The F.20 was issued to second-line units for jet familiarization training. The Vampire was exceptionally versatile, setting many aviation firsts and records. It was the first RAF fighter with a top speed of over 500 mph, and the first jet to take off from and land on an aircraft carrier when an F Mk.1 landed aboard HMS Ocean on December 3, 1945. In 1948 Wing Commander John Cunningham set a new world altitude record of 59,446 ft. On July 14, 1948, four Vampire F Mk.3s of 54 Squadron became the first jet aircraft to fly across the Atlantic, traveling via Stornoway, Iceland and Labrador to Montreal on a goodwill tour of Canada and the U.S. where they gave several formation aerobatic displays that late summer and fall. The Vampire served with front-line RAF units until 1955 and with the RAuxAF until its disbandment in 1957. The airplane also served with the air forces of Australia, Finland, France, India, New Zealand, Sweden, Switzerland, Mexico and the Dominican Republic. 4,400 Vampires of all types including the 2-seat trainers were built, 1,100 of them under license, including 190 built in Australia starting in 1946. The Vampire trainers remained in service with several air forces into the 1980s, and there are still some being flown today. Several Vampire FB.5s still exist and are being flown by private owners, including one owned by John Travolta, who uses it to maintain his jet and aerobatic proficiency. The Vampire has been well-served in 1/72 scale, with a still-good kit released by Heller in the 1970s that can be made up into a nice-looking model with not a lot of effort. 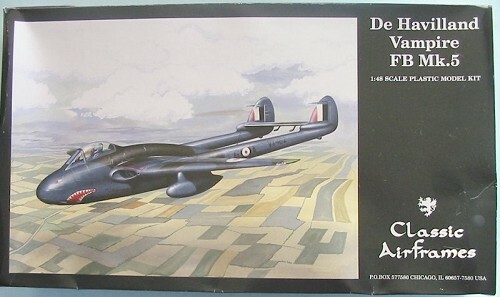 In 1/48, the Vampire was badly served by a series of kits from Hobbycraft in the late 1980s and early 1990s that bore only a general planform relationship to the original airplane. 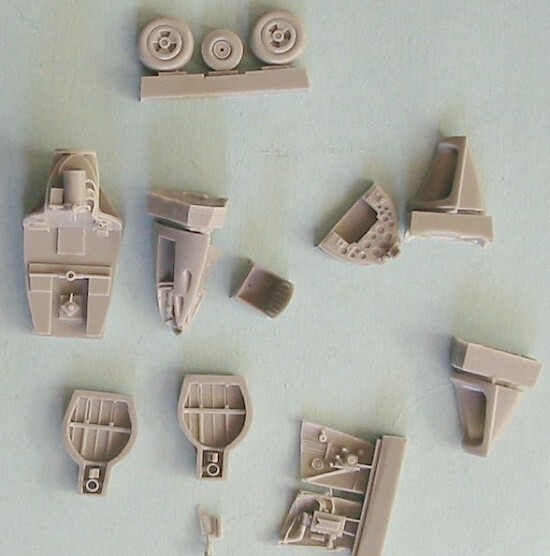 Aeroclub had been about to release a very good series of vacuform kits of all the major sub-types just at the point when the Hobbycraft train wreck came out; these were finally released in 1996, and are still excellent kits that make up into good models for those not afraid of the V-word. This new limited-run injection-molded Vampire from Classic Airframes is announced as the first of a “Vampire family” that should include the earlier F MK.1 and F Mk.3, as well as the NF Mk.10 and T Mk.11 two-seaters. Given that the current kit includes the extended wingtips of the F Mk.3, that type could be built now if a modeler obtained correct serial numbers for it. 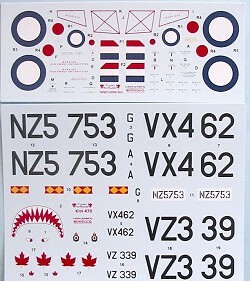 The kit decals include markings for a RNZAF FB Mk.9, which has to be modified with the 8-inch increase in the starboard wing fillet to be completely accurate. 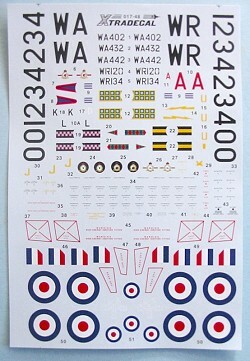 A modeler could also do a Fleet Air Arm F Mk.20 by robbing other decal sheets to cobble together the markings. 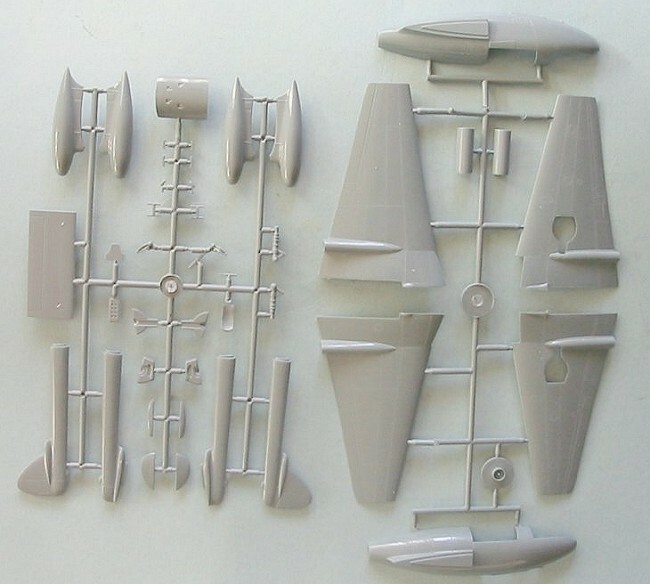 The kit comes on two sprues of injection-molded plastic that contain the main parts of the airframe - fuselage, wings, booms and tail - with the cockpit, wheel wells, and lower fuselage nose done in resin. These parts will make up into a cockpit that looks so nice it’s almost a shame to have to paint the interior black. I suspect that there is going to be a nose-sit problem, since it is impossible to put any weight in the extreme nose; this means the area immediately behind the rear fuselage bulkhead is going to have to be densely packed with weights to get that nose wheel down on the shelf. One might also want to consider adding some weight in the extreme nose of the drop tanks. While the engraved panel detail of the fuselage is the petite variety one usually expects from a Classic Airframes kit, the panel lines in the wings approximate trenches, with raised edges to them in some areas. Thus, the wings will at least require some sanding down to get rid of this, and I think I will be filling these lines with cyanoacrylate glue, sanding them smooth and rescribing, due to the fact these are way too deep to be hidden by any amount of paint. The one part of the kit that really fails is the bubble canopy. It has all the clarity of a coke bottle, and the profile shape of the bubble bears no resemblance to the original. At first I thought mine must have been pulled out of the mold prematurely, resulting in this godawful flattened shape, but I have learned from another Vampire kit owner that it appears to be the production standard. Fortunately, Falcon made a very goo d vacuform canopy for the Hobbycraft kit, which is available in one of their RAF canopy sets. Additionally, Aeroclub still has vacuformed Vampire canopies from their line of vac kits. A canopy from either of these sources will not only solve the problem but improve the look of the finished model since you will be able to see the very nice cockpit. I would like to renew my wish that Classic Airframes would go back to using vacuform canopies, which were, in my opinion, superior in his earlier releases to the injection-molded canopies of recent releases. The kit decals provide markings for three aircraft: a camouflaged FB Mk.5 of 112 Squadron in Germany in an experimental one-off scheme of overall PRU Blue with a disruptive pattern of dark green on the upper surfaces, a silver FB Mk.5 of 421 Squadron RCAF, and a camouflaged FB Mk.9 of 75 Squadron RNZAF. These are printed by Micro-Scale and are of their usual excellent standard. 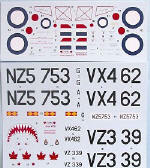 Xtradecal has also released a sheet of their usual excellent-quality decals for the Vampire. Sheet X01748 provides markings for five Vampires, including two FB Mk.5s camouflaged in the UK scheme of gloss dark sea grey and dark green uppers and silver lowers from 612 and 603 Squadrons of the RauxAF, and three in “high speed silver” - two FB Mk.5s from 185 and 213 Squadrons and an FB Mk.9 from 20 Squadron. This kit does not appear all that difficult for the modeler who has completed a couple of limited-run kits previously. Getting the resin nose to fit to the fuselage and the booms to fit to the wings correctly will be the major assembly problems, as well as taking down the engraved panel lines in the wings and cramming enough weight inside to insure a nose sit. I highly recommend obtaining a vacuformed canopy, especially since the Vampire looks best with the canopy closed and there is a beautiful cockpit to be seen under the glass. This kit and the others to follow will go far in filling out the collection for the modeler who likes first-generation/Fifties jets. Recommended. Review kit courtesy of Hannant’s.